Braggiotti Gallery is an art gallery located in the center of the Singel Canal which is just one block from the Flower market. 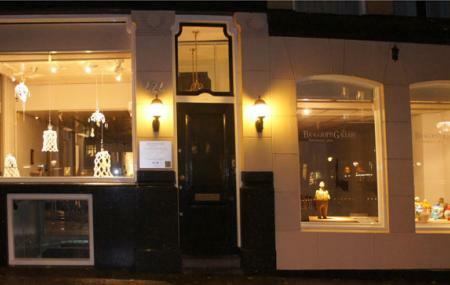 The gallery specializes in Dutch and international contemporary glass art. Visit the destination and get to see some of the best glass art in the region. The place comes highly recommended by both travellers and locals for its great art scene. Braggiotti Gallery sees a lot of tourists all year round. How popular is Braggiotti Gallery? People normally club together Anne Frank House and Rijksmuseum while planning their visit to Braggiotti Gallery. Gallery shows very good creative glass and the owner is charming and knows quality. Great to work with!!! Absolutely awful!!! Staffed by a very short, over-weight, middle-aged man who shouted at me (woman in her mid-60s) when I mentioned how Americans loved knowing some prices before showing any interest in buying. He immediately went pink, twisted his face and then simply lost it. He called me mentally ill, said I was talking absolute rubbish, I was "out of my mind" and then he told me to get out of the place I have no idea what I did to deserve this reaction, and left the shop/gallery shaking. I had intended buying four pieces for a friend's hotel but pffffffffff! Please steer clear of this place.